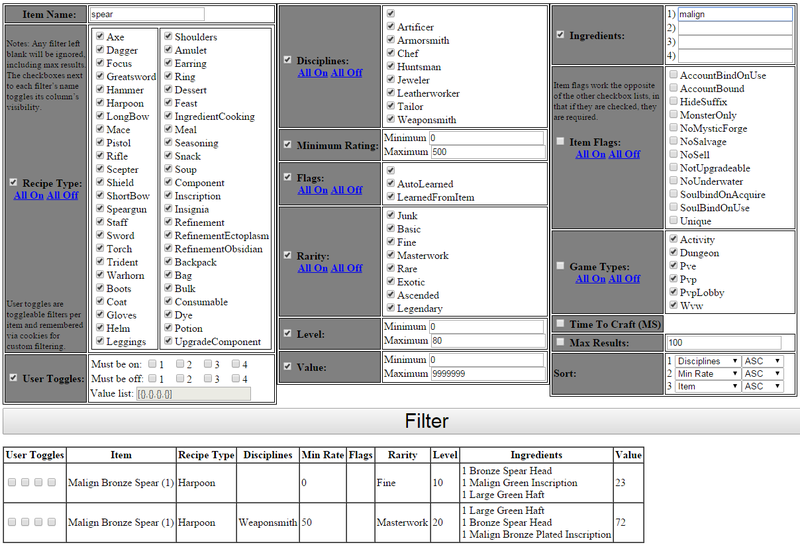 An interface to manage Recipes for Guild Wars 2. The interface allows filtering and sorting recipes by many variables. It also has user toggleable checkboxes per recipe that you can use to group and filter recipes. For example, all recipes with the first checkbox selected might be recipes your primary character already knows. This project has 2 parts. The first pulls all of the Item and Recipe info for Guild Wars 2 into a database. The second is a client side only recipe management interface (no server processing). I threw this together for a friend in 8 hours, as some of its functionality coincided with stuff I needed for another one of my projects. It was not meant to be pretty, so the interface is a bit spartan, and the code comments are a bit lacking. It also doesn’t check user input very thoroughly :-) . Results can be limited to a maximum amount. Do note that if you clear this filter and have it show all the recipes, it might take a while for your browser to render it. I only tested these large data sets in Google Chrome. User toggles are saved via cookies (not too thoroughly tested). The user toggle value list is also shown in a textbox on the interface, for manual copy+backup purposes. Note: Since the php files are not required to run the interface, they can be removed once the "ItemData.js" has been generated. Pulls the info from the Guild Wars 2 API into the database using http requests. It polls the GW2 API serially 100 items at a time. Since there are currently ~9k recipes and ~40k items, and each query takes around a second, this takes some time to run (8-10 minutes for me). Export all the data in the DB relevant to the Recipe Management Interface into ItemData.js. Because of this, the recipe management interface does not need any server side processing. Doing it this way, instead of having each row as an object/associative array, seriously cuts back on the file size. Numbers are also not stringified.